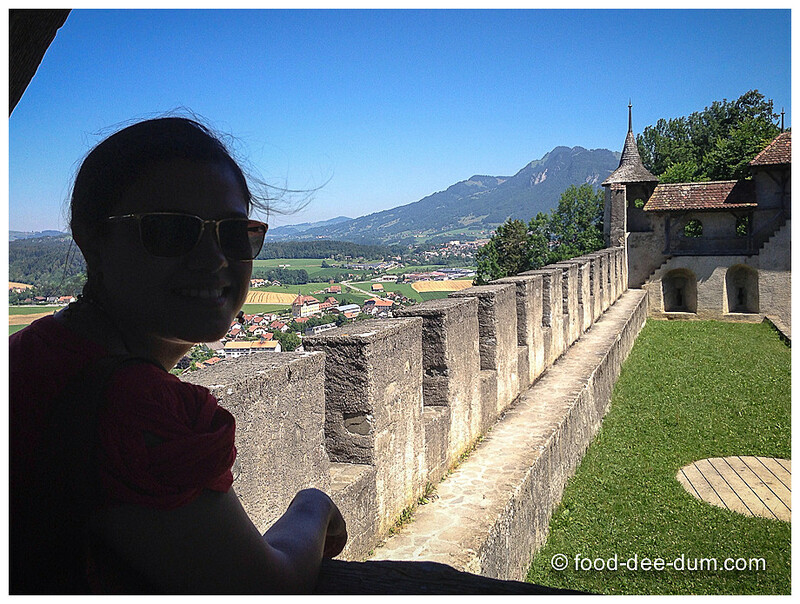 As I had promised here, I have a few more foodie things to share about my trip to Switzerland a few weeks ago! 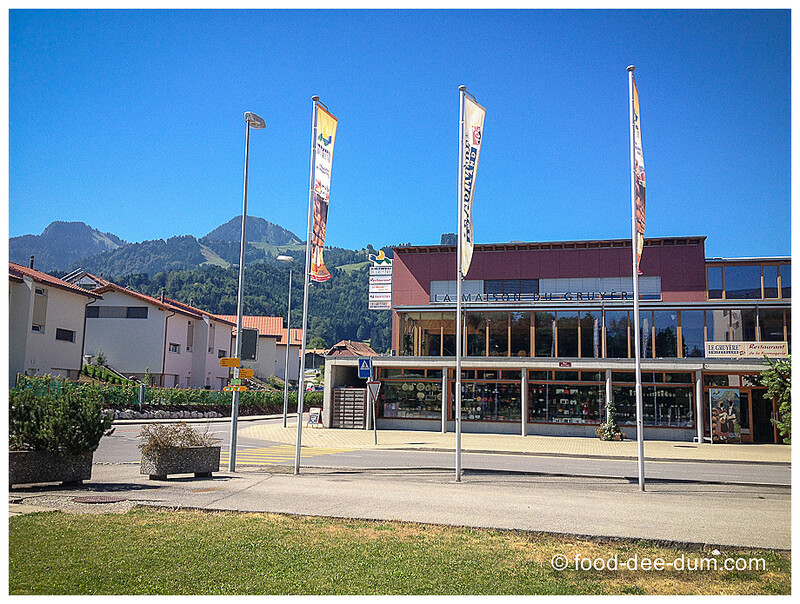 A few days after the ride to the Swiss Riviera, we decided to do something cheese-y (literally) and make a day trip to Gruyeres and visit the demonstration cheese factory or La Maison du Gruyere. We thought about Emmental as well, but that was 3 times the distance away. 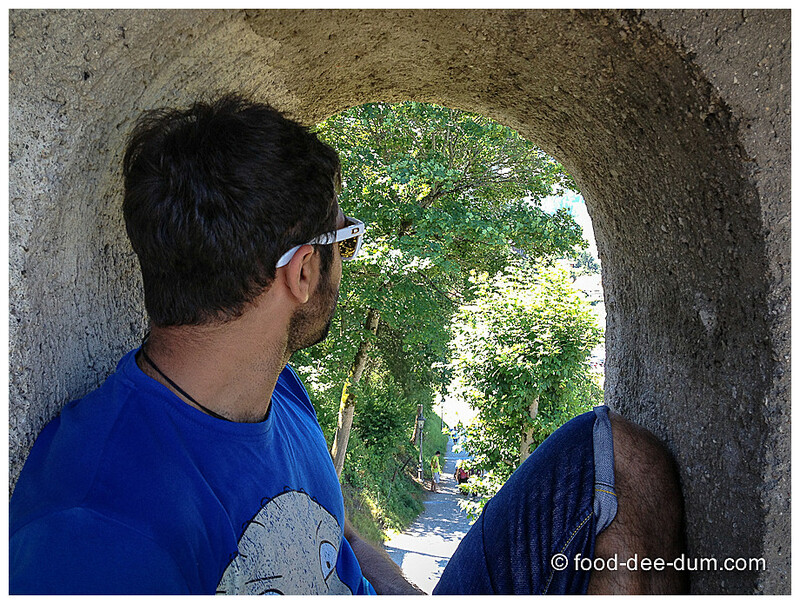 So we simply took the train and were in Gruyeres before we knew it! 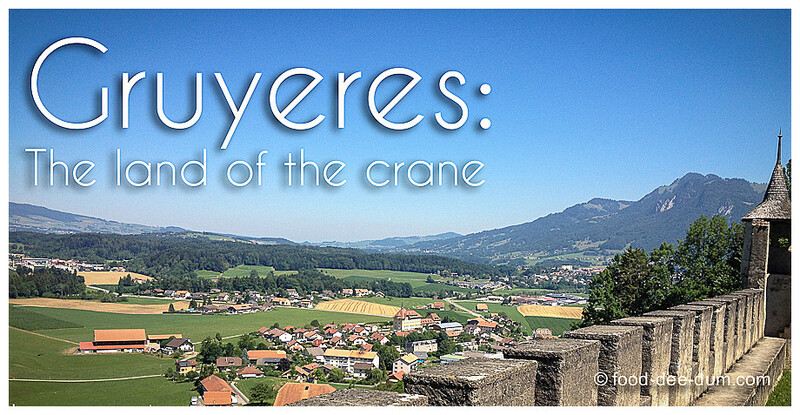 Gruyeres got its name from the crane (grue in French) which is on its municiple coat of arms. And you can actually see the symbol all over the town. I acidentally deleted some of those pictures so couldn’t share them here. We took the train from Lausanne and changed at Romont and Bulle. The train from Bulle-Gruyeres was a cute narrow rail one! The station at Gruyeres is a small one and as soon as we exit, we could see La Maison du Gruyere. We went in, bought our tickets and started the tour. There were audio guides and the narrator was an incredibly cute cow called Cherry! 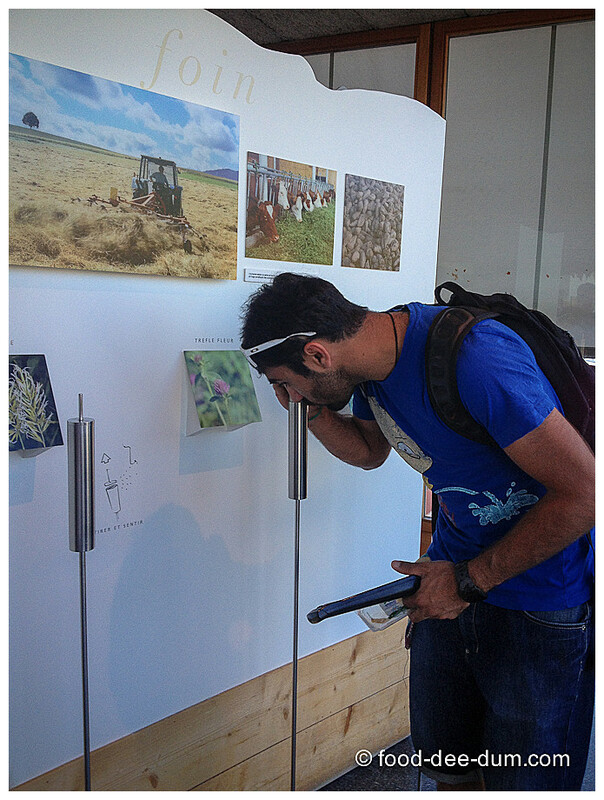 The usual museum tour with pictures and information regarding the history of Gruyere cheese was accompanied by a really interesting thing — when Cherry mentioned all the different plants/ leaves cows eat and how the flavour of the cheese is influenced by it, she told us to step forward and sniff these holders which were full of beautiful aromas like vanilla, lavender, cloves etc. 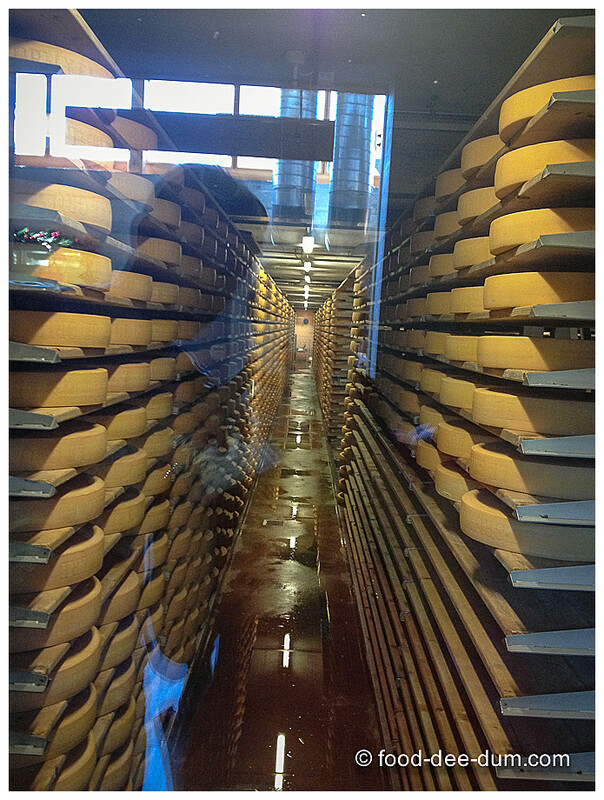 When we finally entered the viewing room for the cheese production chamber, I was very excited! 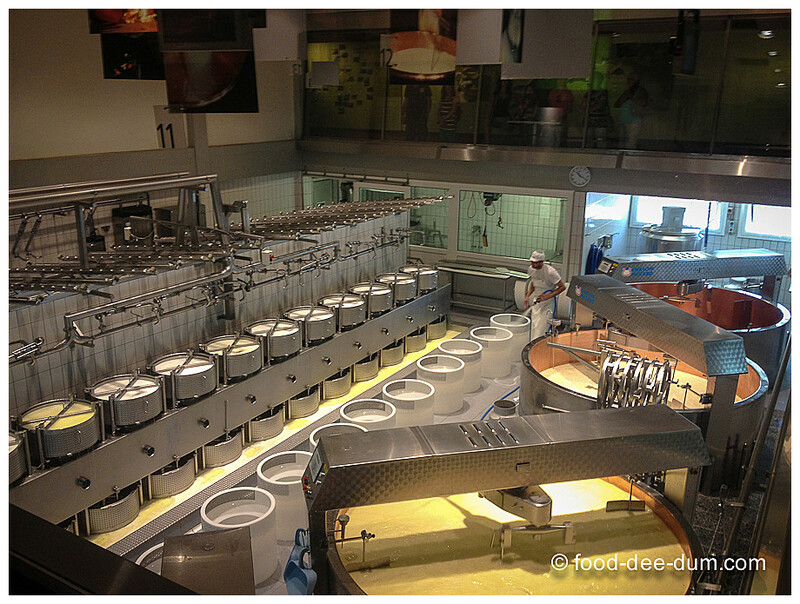 I got to see the whole cycle of the milk being warmed, curdled, cooked further & being poured into the moulds etc. The rest was explained on graphics and audio/video. Since the milk was already in the warming+churning vessels, the rest of it took between 45-60 minutes and most people lost patience and left, but I was glad I waited! In fact, Adit wandered off, exit the area and had to beg to be let back in to find me (phone signal is useless inside that viewing area). To the right are the warming+churning vessels (I’m sure they have a cooler name but I’ll be damned if I know what it is) and to the left are the moulds — I don’t know if you can make out but all the whey flows out into the receptacle at the bottom! After reading a bit more on the walk out, we ended up outside the curing cellar. There is a restaurant and a gift shop within this building, but we decided to give them a miss. 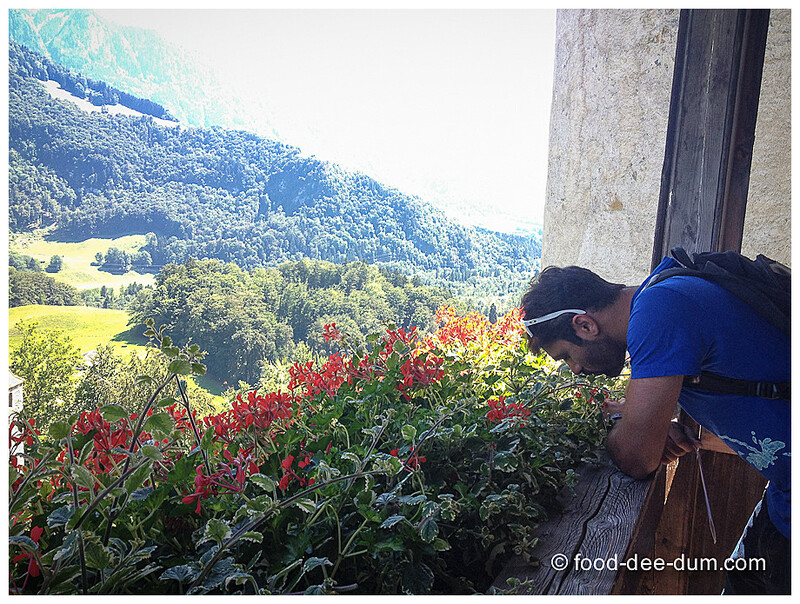 When we bought the entry tickets for the cheese factory, we chose the combined option for Gruyeres Castle as well and decided to make our way up there. 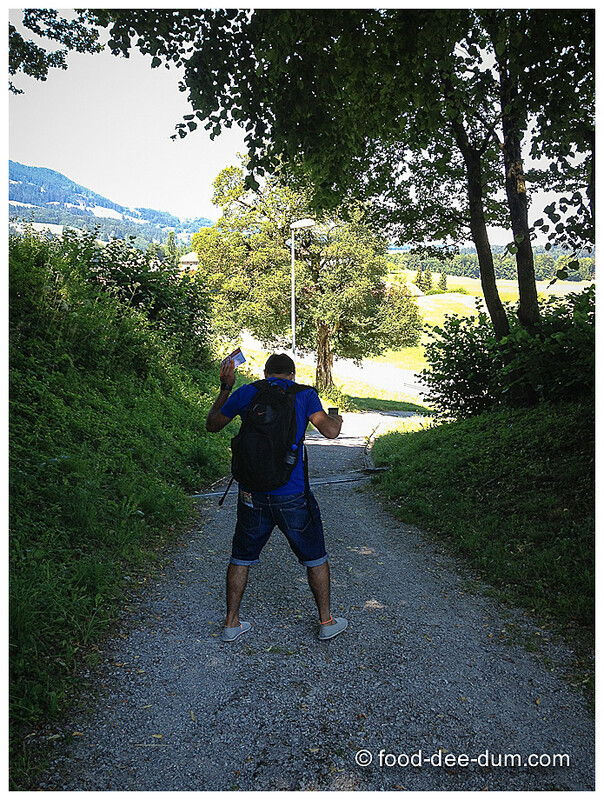 It was about a 10-15 minute walk but my brilliant brother doesn’t believe in using the technology in his phone (read iPhone 5 with data and a map). He only likes hard copy/ old style paper maps but didn’t buy one. So we ended up walking for 40 minutes and seeing no castle! 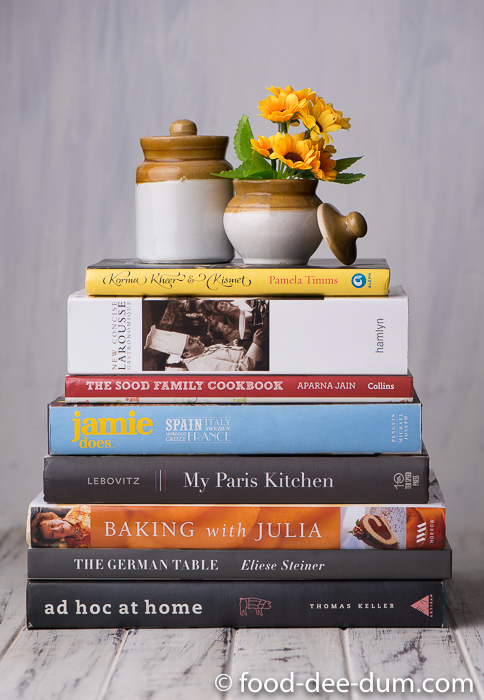 Cutting our losses, we turned around and found our way again — and boy, it was a bit of a trek uphill! On an aside, I don’t know if you can tell in this picture, but Adit was hopping about for 3 straight minutes trying to get rid of a persistant bug. We finally reached the outer walls of small town and took a moment to catch our breath and enjoy the view before heading towards the Castle proper. You can see how high up we walked from these pictures! And people of all ages and sizes did pretty well on the walk up, but they did stop for a moment to re-group, just like us! We were hanging out on this little viewing platform and taking pictures. 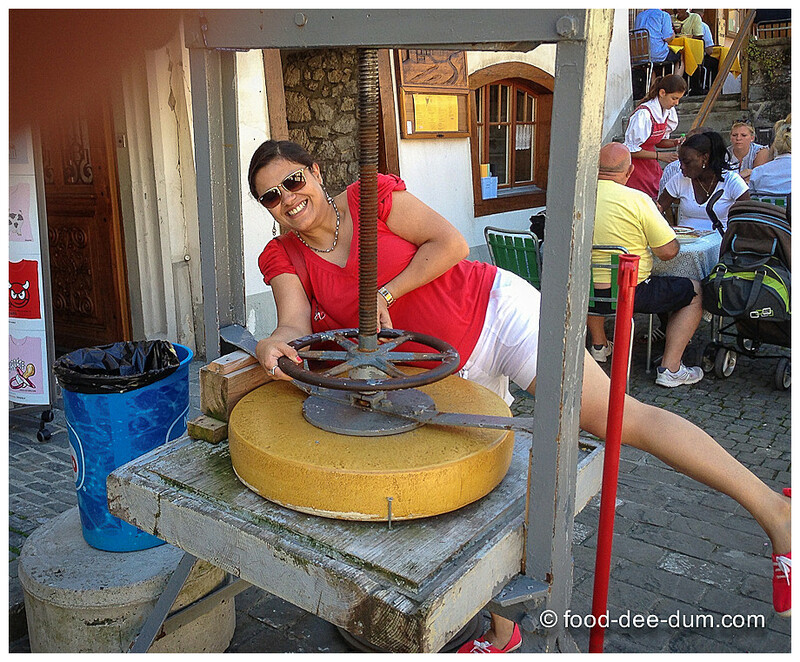 When we walked into the main square (or round) of the small town, we couldn’t resist this pic! 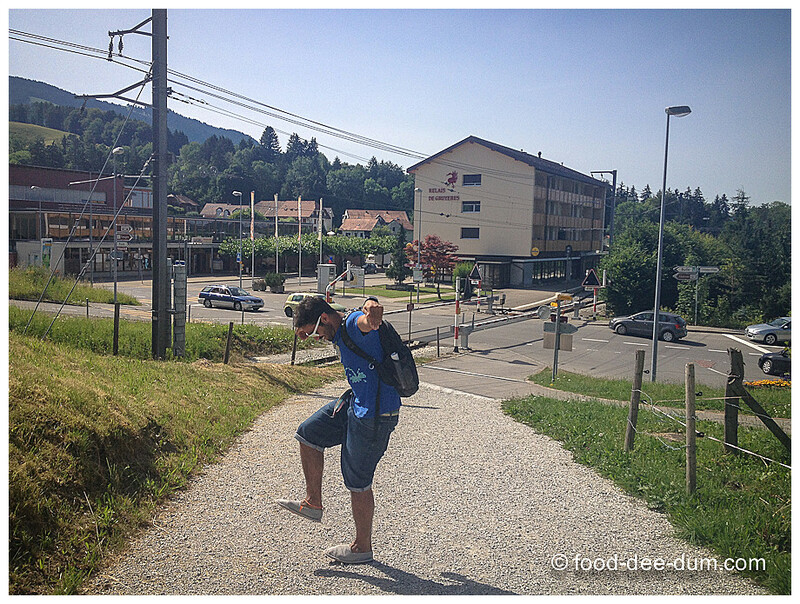 After all, we’re in Gruyeres, the land of cheese and the crane! We started walking up to explore what else was around and found a lot of cafes with terraces that promised quite a view. And, of course, a lot of gift shops. 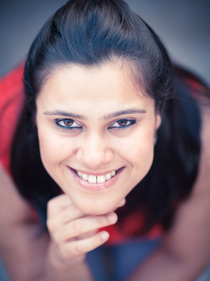 And then we found what we had been looking for. Someone we met at Interlaken had told us that we MUST visit the HR Geiger Museum and Bar. 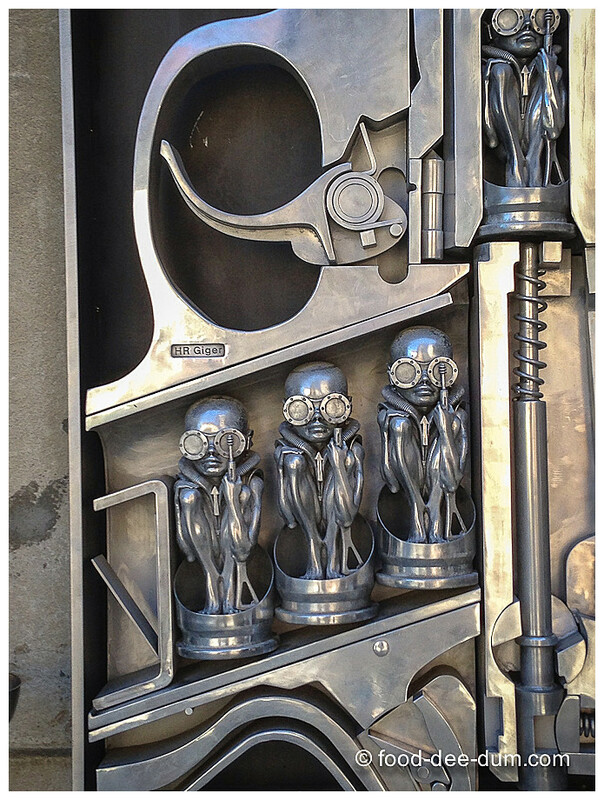 For the uninitiated, HR Giger is a Swiss Surrealist painter & scultptor. 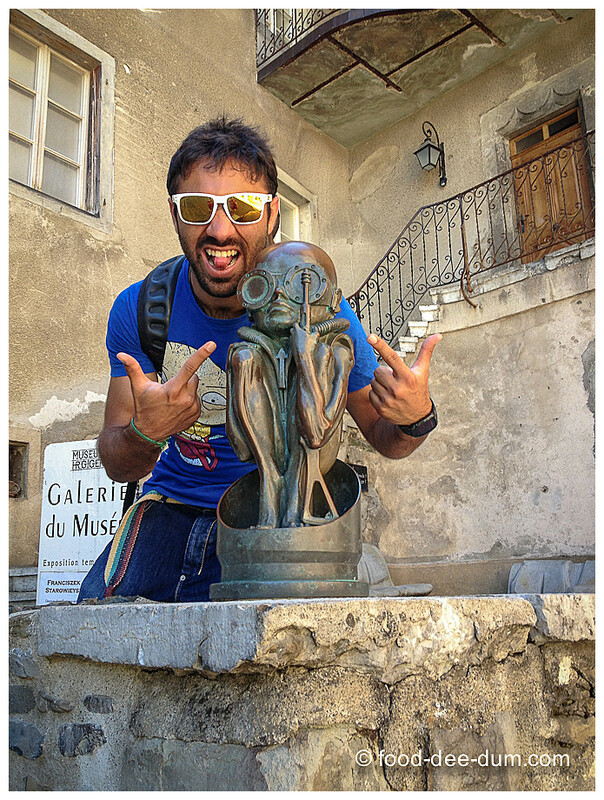 Outside of Switzerland, he is famous for his Academy Award winning sets and visual effects for the Alien movie! There is a museum displaying his art and a neighbouring Alien themed museum bar! We didn’t feel like paying for more tickets so we skipped the museum and, obviously, head in to the bar! We did take some exterior shots of the museum though. And the bar. Don’t miss the Alien coffee! 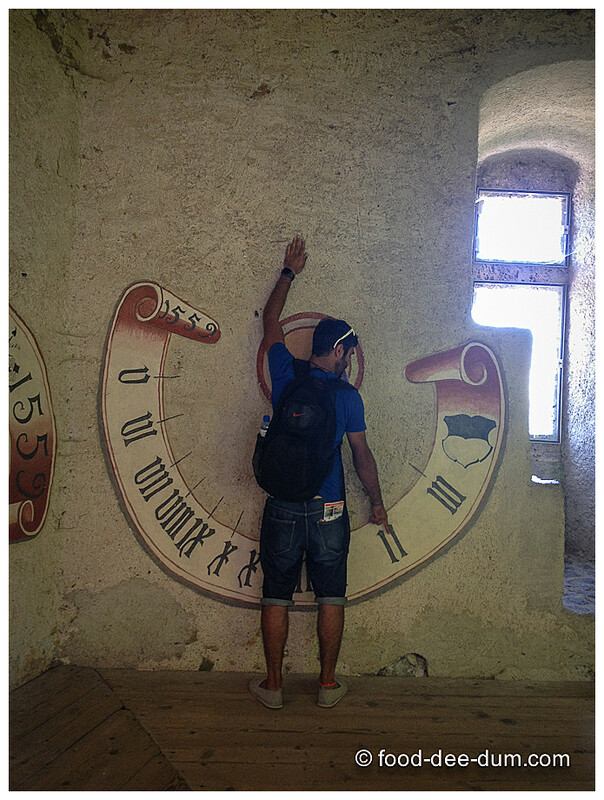 We kept it simple and had a few beers before moving on to the castle. It’s not a huge one so a full tour with the audio-guide didn’t take us more than 30-40 minutes. It was a little museum-y so we didn’t take too many pictures. Just some silly ones for our own entertainment. By this time, we were a little tired and thought it was a good time to take a break. We decided to make our way back to the small town square and grab some beer and grub. Most of the cafes offered fondue and we meant to try it but we didn’t have enough appetite to do it the justice it would deserve. 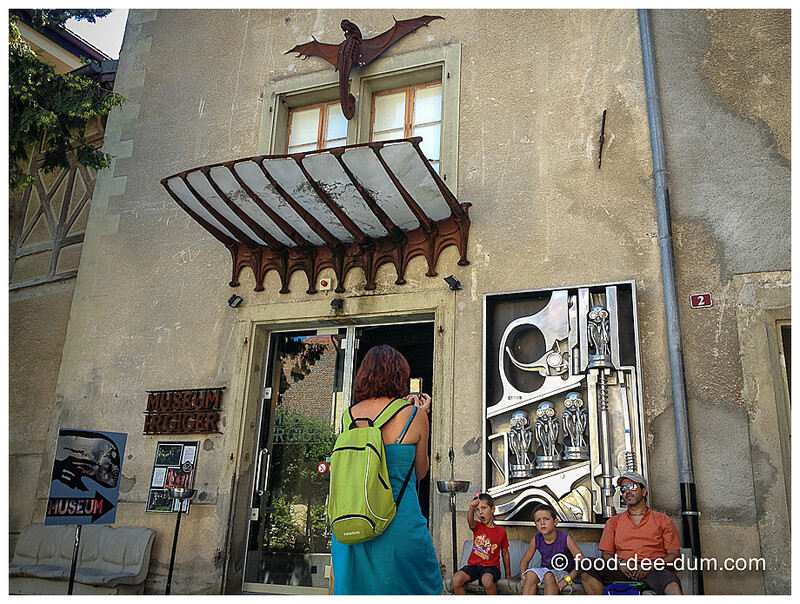 So we aimed at Cafe Restaurant des Remparts – recommended by Adit’s friend Jeremy who is from Gruyeres – and ordered an apero planchette to go with our beers. 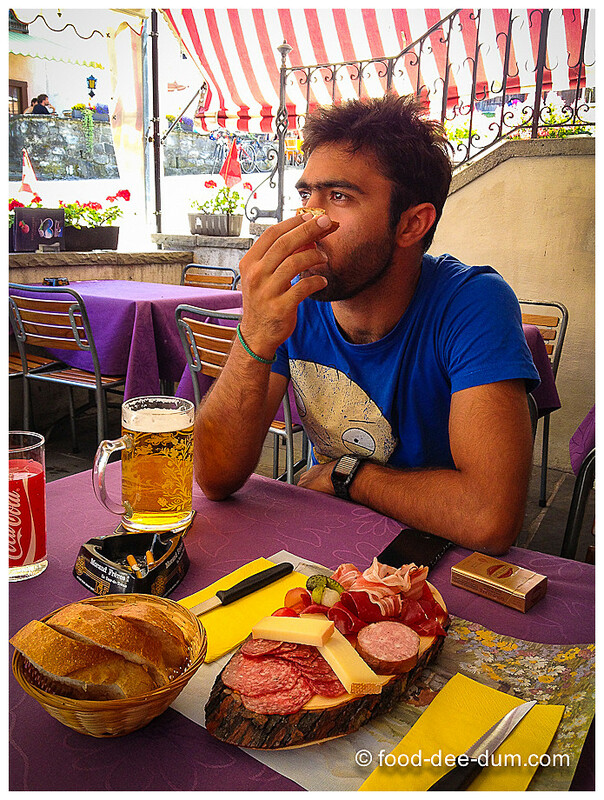 This is a very typical Swiss mixed appetizer platter of smoked, dried or cured meat along with cheese and pickles etc. 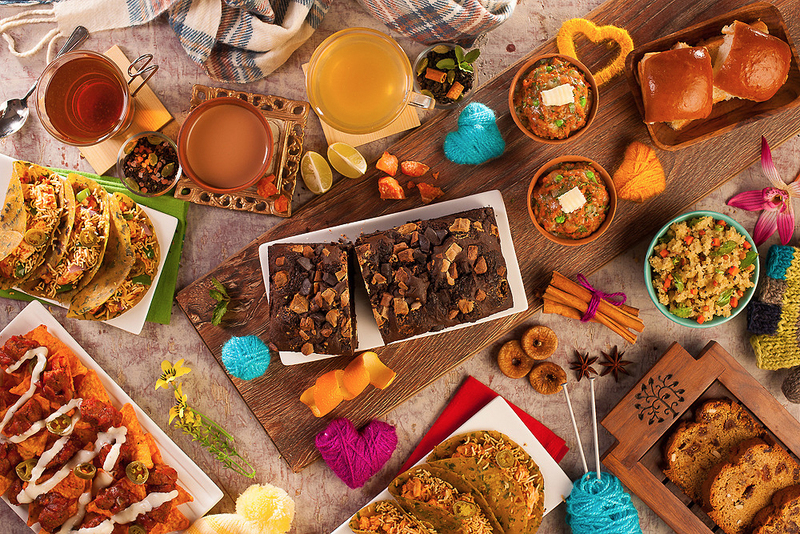 Very often it is served with bread, but you can always ask for some if yours doesn’t come with. We went through the platter and our beers pretty slowly, because we knew that the end of this meal meant that it would also be the end of our little day-trip! We walked down towards the station on a different route — because this time we didn’t have to follow the non-existent map in Adit’s head. There were a few small signs along the way to lead us and we were back much earlier than the train. 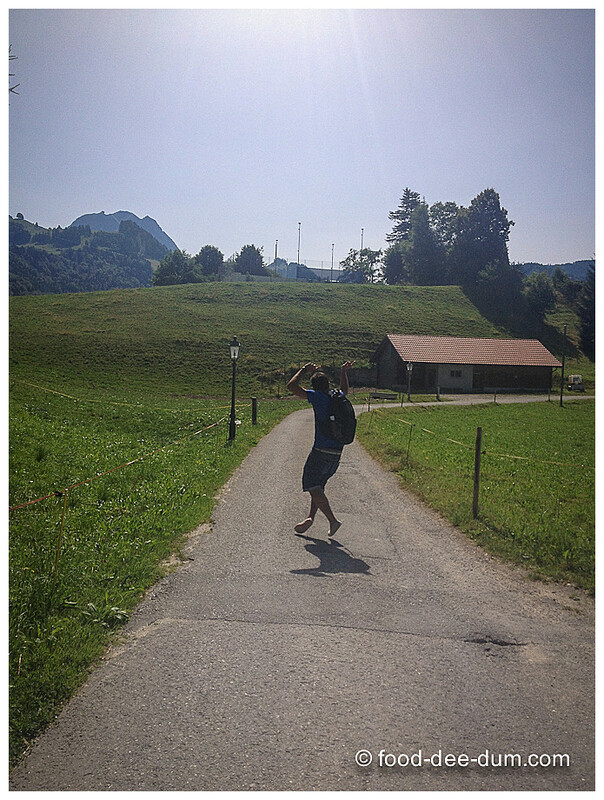 This is Adit doing a little Shahrukh Khan-esque prance through the Swiss fields, probably looking for Senorita! When I saw the crane on the station, I made him pose in front of it. You guys know that I’m going to be in trouble for posting these pictures of Adit right?! But it was definitely worth it because it means that I was able to share my favourite memories from the trip. And maybe give you a reference point if you mean to travel there anytime soon. Another aside: you know this is a small town when there is no electronic ticket machine at the station and the clerk had to painstakingly write one out for you! Definitely a first for me in Switzerland. Coming up — Lausanne and Interlaken. By train from Lausanne, via Romont & Bulle. The Bulle-Gruyeres train is a narrow rail one and incredibly cute. Bulle is conected to most major Swiss towns by train. You can get in by road as well through Fribourg and Bulle, but I suggest you check out the route yourself if you intend to drive. 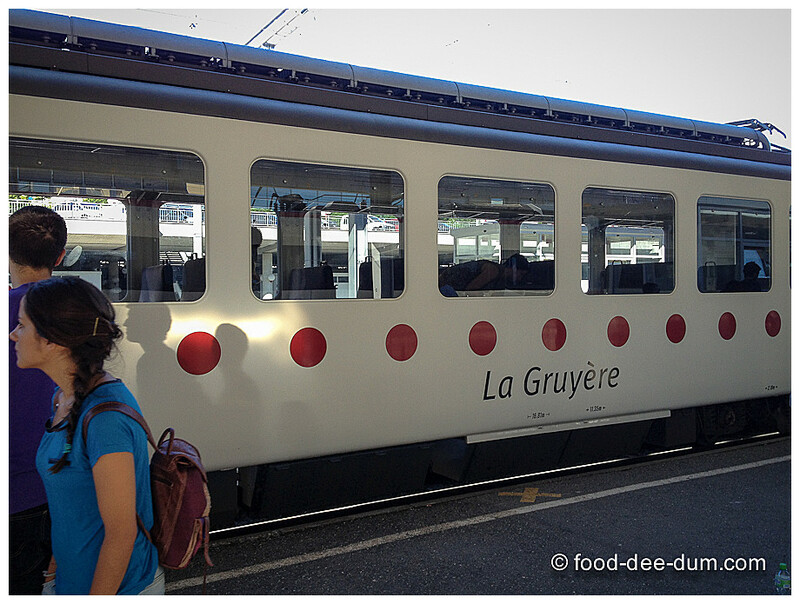 Train from Lausanne-Gruyeres was 27 CHF one way fare and simply double for return fare. La Maison du Gruyere entry is 7 CHF but you can buy the combined ticket for the Castle+Cheese Factory for 14 CHF. Oh, and you get your very own cheese sample to eat while you explore the factory. 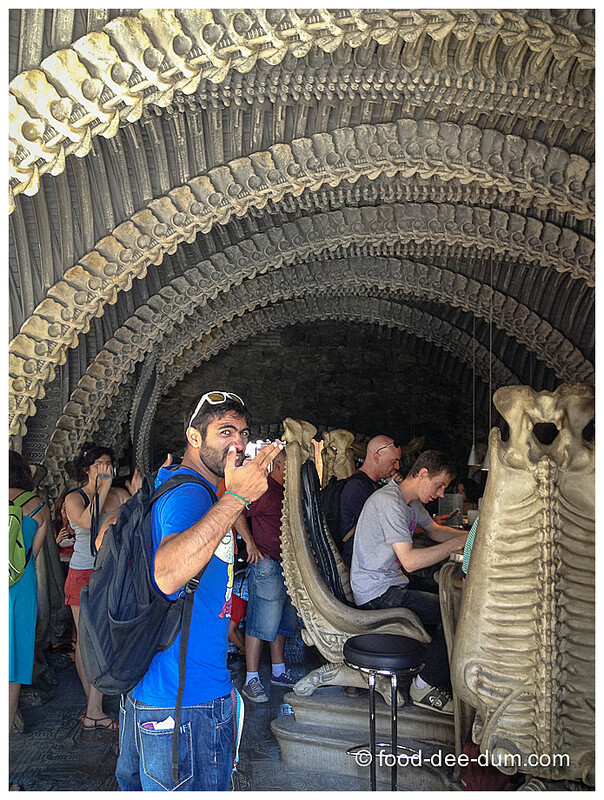 HR Giger Museum was 12.5 CHF/ adult but we didn’t actually go in. I don’t remember what exactly we paid at HR Giger Bar but I rememeber thinking it was average price, like most other places we had been to. So beers on the tap would have ranged from 3-7 CHF each, depending on which one and what size you choose. 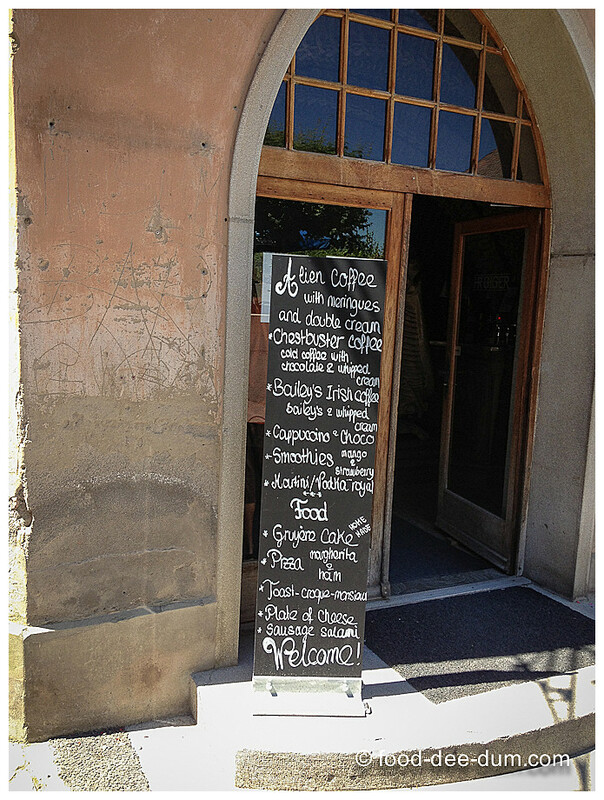 At Restaurant des Remparts, we paid a little under 30 CHF for 2 large beers and the planchette.